Barbara Kopple’s latest film A MURDER IN MANSFIELD is a film that sneaks up and hits you from behind. It is a simply told tale about a man named Collier Landry trying to finally lay to rest all of the emotions that resulted when his father killed his mother. The film is a mix of archival footage (news reports, court room testimony by the young Landry and police crime scene video) and Landry's return home where he is trying to put the demons to rest. We watch as he attempts to contact the sister he hasn’t seen in almost 3 decades, talks to his adoptive family, friends, police and most chillingly the father who he hasn’t seen in decades. On the face of it this would seem to be a typical victim tries to make peace with a tragedy tale. In its way it isn’t any different than many of the films that fill the various cable TV channels. 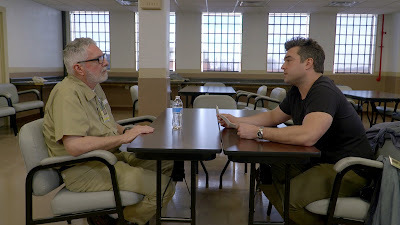 However the person telling the story is Barbara Kopple, a master storyteller, and she subtly works overtime on your emotions building everything up until the last act when -Landry goes to prison to confront his father. What happens is not what anyone really expected with the result the film has a quiet power that is amplified by how things are not resolved neatly. I was kind of waylaid by the emotion and thoughts that were kicked up. I was left staring at the screen trying to make sense of it all. It is in this final section that the film goes from a good to great. You will forgive me for not going into the greatest detail or discussing what happens in the film but this is a film that builds in intensity as it goes. It’s all about the trip from start to finish and I don’t want to clue you in to anything especially since thing hinge on what we think we know as opposed to what we discover the reality is. I’m certain all of the other reviews and pieces on the films will go into more details. I don't want to do that since knowing too many details may lessen the films impact. As good as the film is the one thing that troubles me is that I don’t know what I think of Collier Landry. Watching him testify as a child he almost appears to be playing a role. His testimony is better than a Broadway actor could probably manage. And while its clear he had nothing to do with what happened he seems coached. I suspect it’s a need to be liked or loved now that his mother is gone and his father is in the dock. The adult Collier also seems to be on. Watching him he always seems to be aware of the camera and seems to be playing to it. While there is nothing really wrong with it, it is simply the way he is, it kept me from fully giving myself over to the film. And while I was moved by the film the fact that I didn’t really like him kept me from completely going gaga for the film. Reservation aside, this is a killer film by one of the best documentary filmmakers working today.